Tentacle Software, creators of the popular add-in Disk Management, have been hard at work with a new add-in called Blackbox for WHS which they have just announced and are soliciting people for testing in an initial closed beta. For more information and to request access to the closed beta, visit the Tentacle Software website. 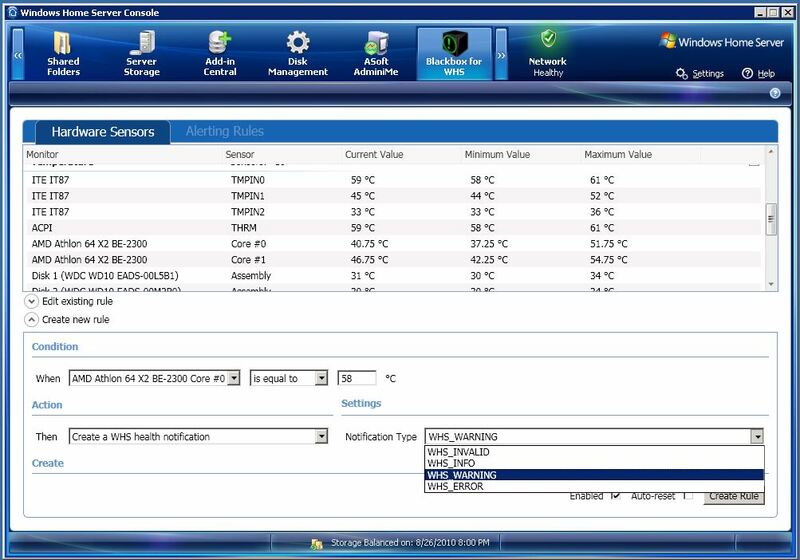 Blackbox for WHS is a hardware monitoring tool that utilizes the information from supported motherboard ITE Chips, CPU Thermal Sensors, Hard Drive SMART Sensors and UPS Battery sensors. 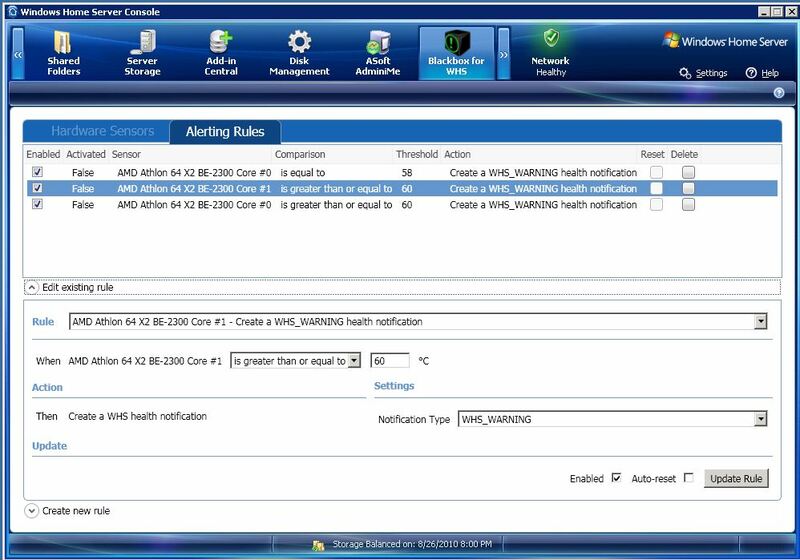 The add-in also allows you to configure Alerting Rules using various IF/THEN scenarios. 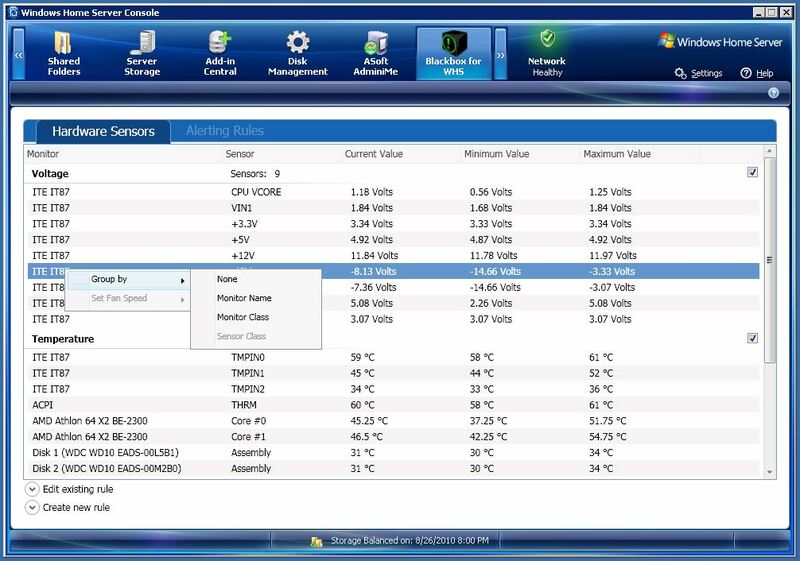 Simply put if your CPU starts to run too hot you can simply speed up the system fans or shut the server down or you can create various logs making the software very configurable for your needs. This picture above shows that you can setup the viewing screen by sorting the various types of sensors into groups. The next set of pictures show you how to set up the Alerting Functions of the software. 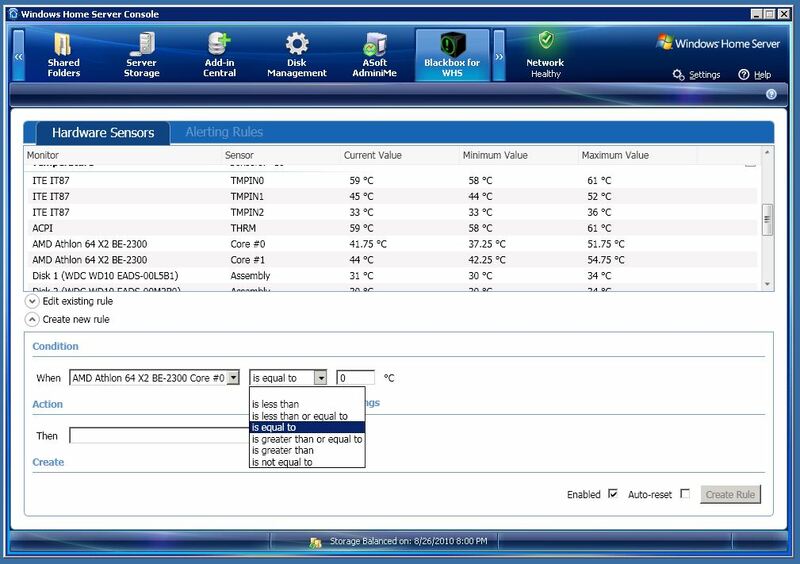 This allows you to select the sensor you desire to monitor, determine the way in which you want to monitor that sensor and the type of alert or adjustment to the servers operation you wish to make. Any WHS Alert Notifications can then trigger other types of notifications which can be sent to your email as with Remote Notification available on this site or with one of the many other programs like @WHSTweet which I like because it uses Twitter to send text messages to your cell phone. Blackbox for WHS comes with a well written 9 page document making it one of the best documented add-ins I have seen to date. I do encourage those who download this add-in to take the time to review the document before installing the add-in as it will prepare you well on how to configure the software. The document also covers the current known issues with the software. Blackbox for WHS was written for WHS v1 only. 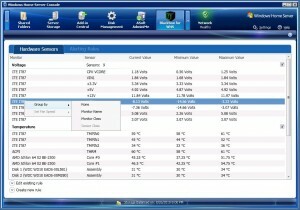 I tested the software in two servers and HP EX470 MSS and an HP ProLiant. 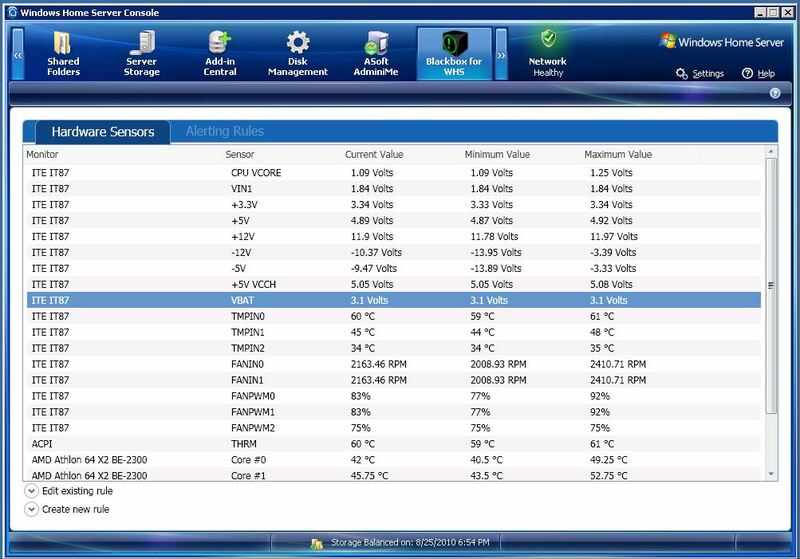 The software works great in the EX470 and while it did work in the ProLiant it did not have the sensor support that the EX470 had so the information provided was limited. Therefore the results you achieve all depends on the motherboard you are running. 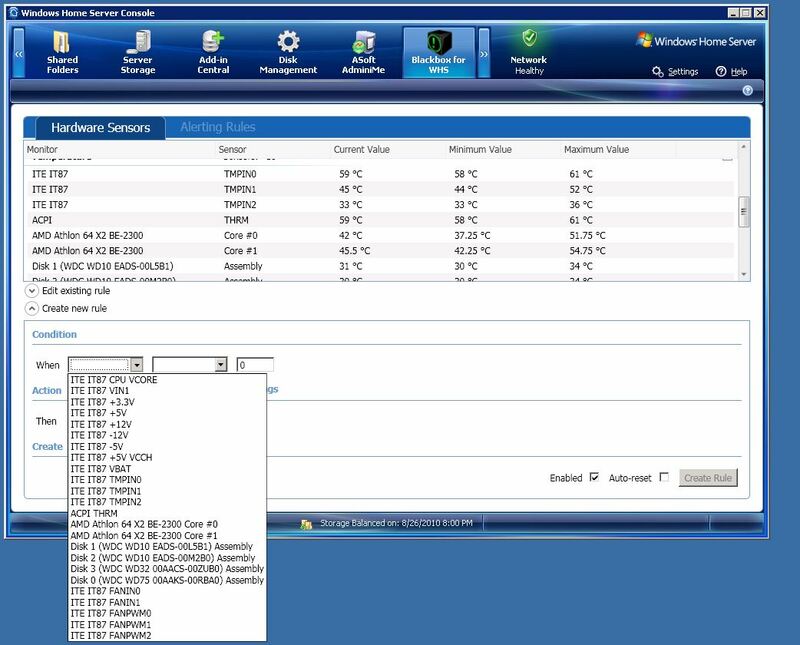 For example, here is a screenshot from the HP MediaSmart Server EX495 which does not have the same number of sensors as we see in the EX470 servers. If you like Disk Management you will also like BlackBox for WHS as it is a well thought-out add-in which empowers you to take better control over your servers operation. If you do install this add-in please feel free to post your comments and share with us the Server Model or Motherboard installed in your server which I am certain will be of benefit to others. For more information please visit the Tentacle Software Website.